We make it our goal to not just repair and return original equipment back into service, but to make incremental design life improvements to increase its life and value. Our engineers apply a philosophy to recondition and redesign existing equipment, to lower repair and operating costs, all while significantly increasing campaign life. 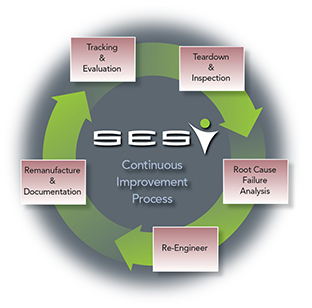 Utilizing an extensive, five-point process, we're able to diagnose, analyze, and repair the failure, save time and money, reduce downtime and rebuild frequency.